This is my first review on this blog! I found this site through roseyume. She looked awesome in her red lenses and we both have green eyes, so I decided to look through her reviews and found oh my kitty (& a fun 10% off code). The service was awesome! They updated my order & shipped it so so fast from when I sent it in. Shipping was affordable and they gave me TWO lens cases for both of the ones I ordered. I prefer to pay by Paypal and the option was there indeed. The site is really really easy to navigate unlike some sites that sell circle lenses so I was happy about that, being a newbie! Came with a pamphlet with a mini-review (maybe coincidentally) of the other lenses I bought! I will review them later. Today is about Hana!! It's roseyume! She looks really cute as Gasai Yuno. Let me start off by saying I wanted this to cosplay Kotori Minami in July for Anime Expo. I probably shouldn't have opened it yet because now I have to clean it every day but I was way too excited LOL! At first glance on the website I thought the lenses looked a bit too harsh, because their model photo had very light eyes. I decided to just go for it and buy it since they were on sale and had some good reviews for the series... who could resist? It was only $9.90 USD!! After putting them on today after soaking it in solution for a whole day, I love the way it looks. It's definitely a dramatic effect, and I think it's a bit for me to wear every day. And here's the big reveal... me in full cosplay! 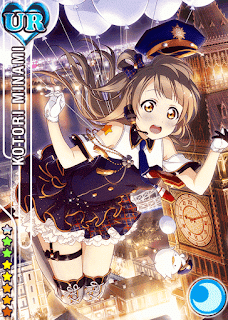 I'm Cop Kotori (Card #565) from Love Live! Comfort: 4/5??? : I'm a bit of a newbie to lenses so it may improve over time! I only wore circle lenses ones before, years ago, and I can say these are a bit more comfortable and I don't get blurry spots. Color: 5/5 : Exactly what I expected! Overall: 4.8/5 : May even go to 5/5 if my eyes adjust to it!